what is/was the original function or purpose of these two unused clip holes in the photo below (and any on the other side above the line of the toolbox ) if a car does not have wiring loom in that location? Comment: There are several holes (in the same places so unlikely to have been put there after manufacture) on both my cars that do not seem to serve any purpose. If a changeover was made from one loom route to another often the new holes would be added to the manufacturing drawing before removing the old ones to allow stocks of old looms to be used up. It is then easy to forget to go back and remove the no longer required holes. 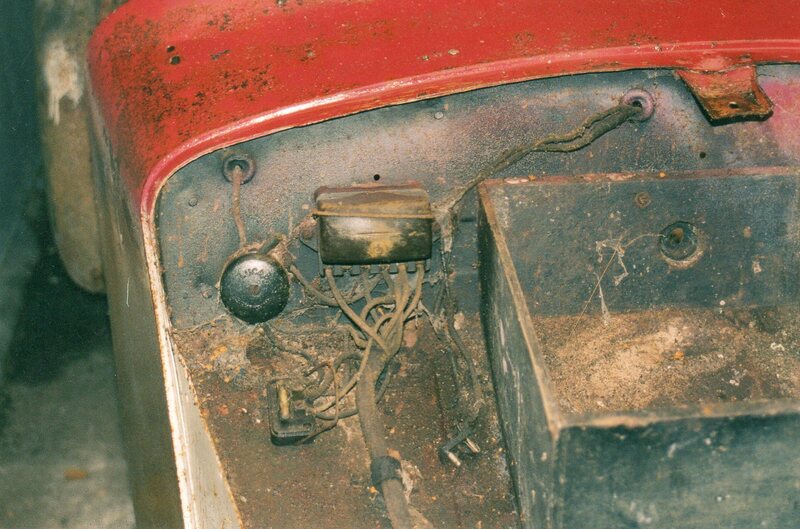 2. this is an original junction box (below) on a 1935 car. So might the part have been changed at some point while the car was in use? It is listed and pictured in all catalogues 1935-38 and noted below as being for the horn. Also note that the listing specifically lists the double clip used twice as for cable harness to dash. Comment: This is possible but it would not be uncommon for a parts list drawing to show an alternative part. Both the Fowler and Williams cars have the same junction box as the ’37 car. Given the simplicity of a junction box it is hard to believe that they would require replacing. 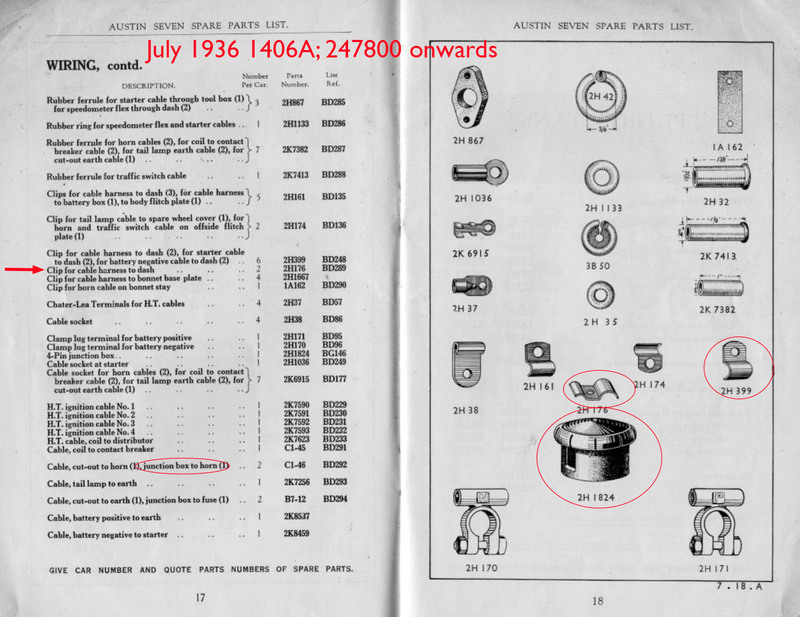 Comment 2: it is also not unknown for parts catalogues to have erroneous parts. With a ’37 car, it is quite possible that the 1933 part had by then been updated to the later one in the new car supplied. 3. these are the only material wiring changes noted for the Nippy for 1936/7 – but can we definitely assume that the wiring is unchanged just because not listed? 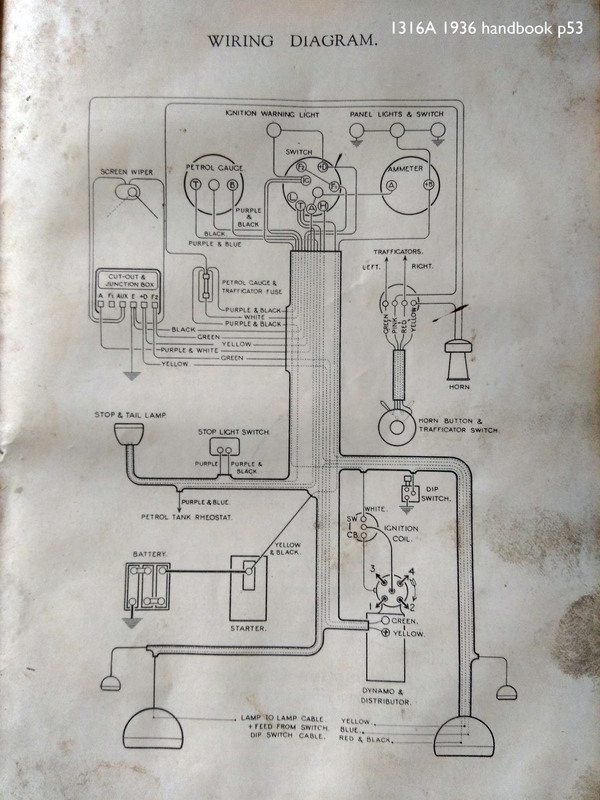 4. a 1936 handbook wiring diagram. Can we assume this is also the same for the Nippy just because no changes are listed? Comment: The obvious difference to this wiring diagram is that the connections to the rear of a Nippy (rear light and fuel sender) are made with armoured cable that is not part of the wiring loom. 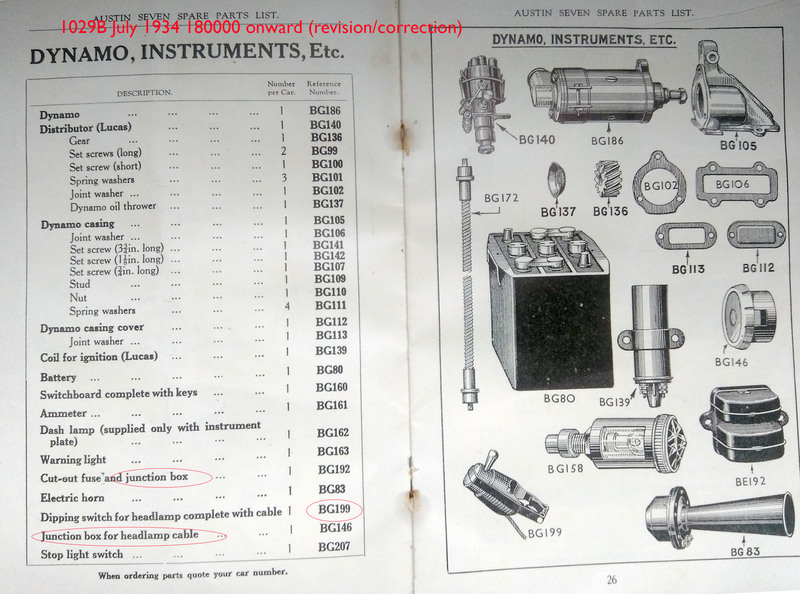 5. first 1934 parts catalogue. note SAME junction box pictured but not listed! Junction box NOT identified within the wiring section. 6. Revision of the above, 6 months later. Note the use of the junction box for headlamp. Again, no use for wiring section as cars still do not have central controls. But where WAS the switch for trafficators in those early 65s? Note also the dipswitch parts number changes. For any reason? Probably just a mistake. Note also the CFR is listed as a junction box. Do its connections change much from the CFR2 for which the common wiring diagrams exist? So, it may be that as cars were upgraded, the function of the round junction box changed. In List 1406A (cars 247800 onward), the junction box does NOT appear in the dynamo/instruments listing ,whereas the CFR2 and “fuse box for direction indicators” does. 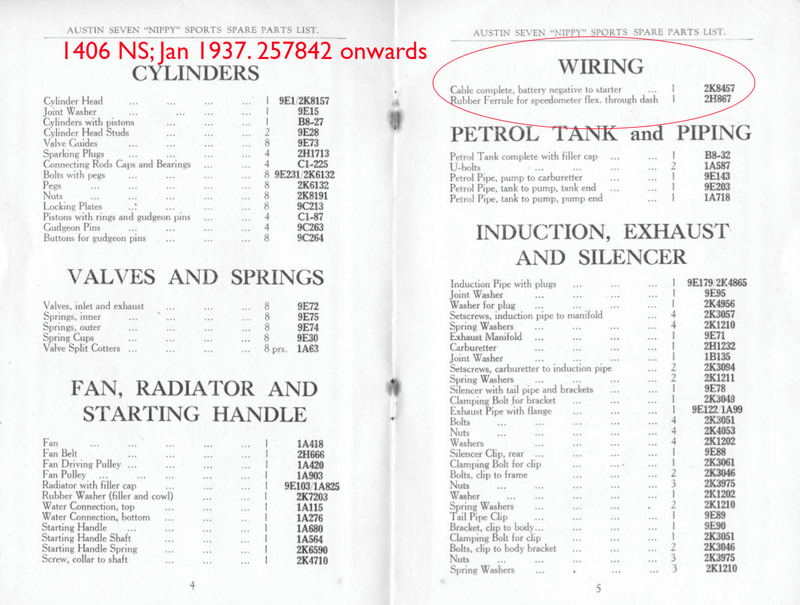 Note also the 1934 handbook wiring diagram below, confirming the change over in use of the junction box. So can anyone determine when the changes would have occurred in respect of 65 and Nippy, with what outward effect? 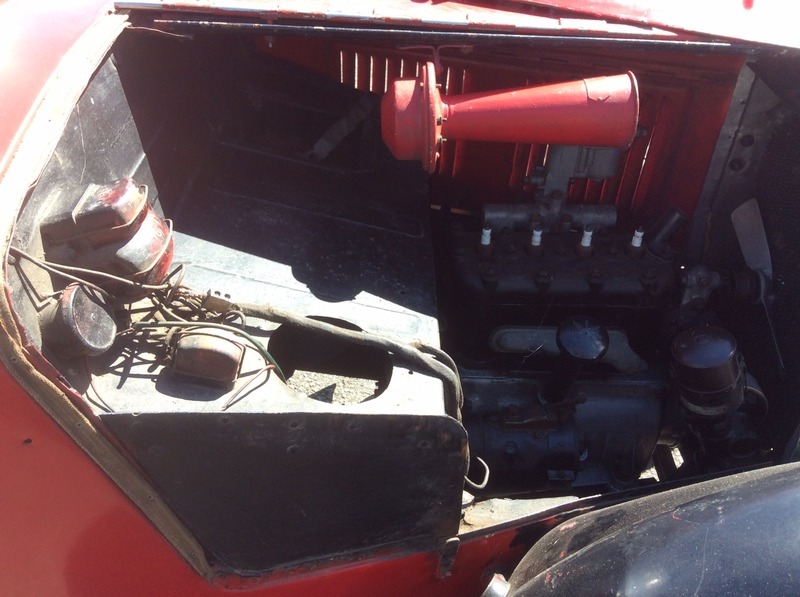 One can see how confusion occurs, but was there a physical change in the lighting regulations/function that meant lighting came out of the junction box… or just the greater need with the steering control cluster? Comment: I think 1936 was the year that direction indicators became compulsory but as they could already be fitted to Nippys I can’t think why this would mean wiring changes were needed. 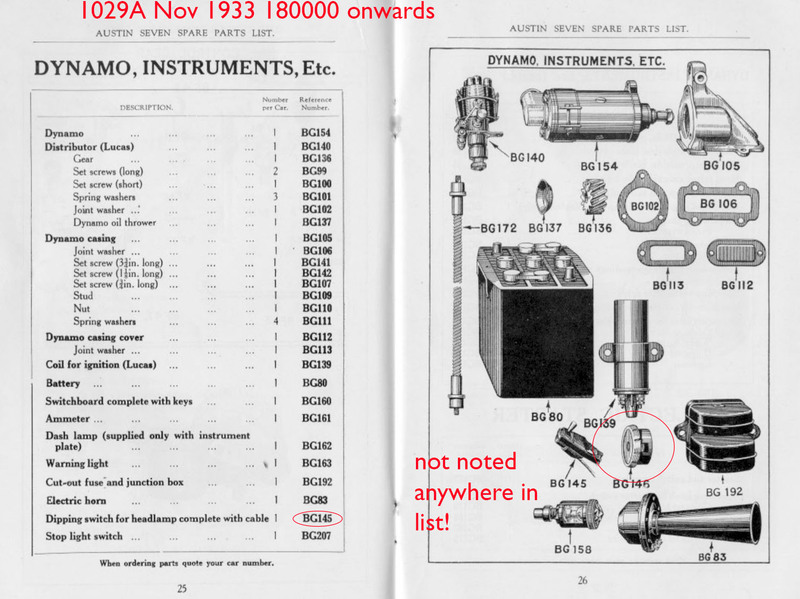 We could do with assessing the parts lists for 1935 (not online; 1218 A and B) to see if its possible to determine how and when functions change. This image has also emerged. 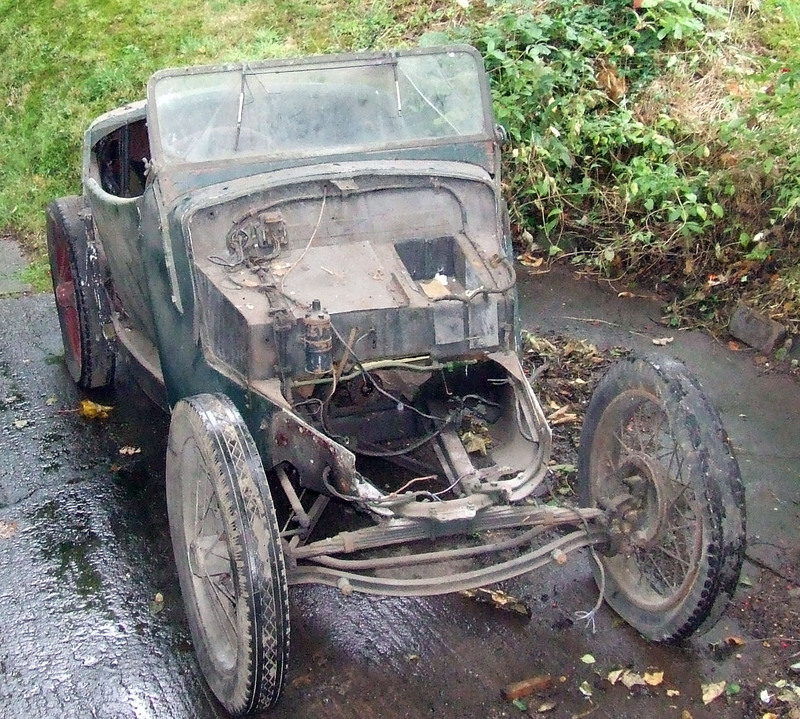 This car can possibly be dated as between 180000 and 185500; body 150-250ish (we understand it is “1933” from DVLA, and it has horizontal gussets) BUT it still has bakelite clips as per Boorman’s body 24, now no longer lining up with the (later spec and differently located?) control box. And an up and over loom! So was it part of the first evolution toward looms, but the design abandoned perhaps as the cable length was longer? 1 comment: you can see the normal 3 holes for a Nippy/65 screen upright. Has the same black bridge type cable clamps o/side as early cars but with a loom, which looks a bit odd. Clamps n/s and then up and around and behind the battery, possibly some of the leather ones, then big full saddle clamps – don’t think I’ve seen them before. At least four wires through wing – so later lights or poss extra wing top side lights too? Cut out is not the earlier one and there is a (?) round Lucas connector block adjacent – early ones had connector behind dashboard. Comment: I am reasonably convinced that the front bulkhead wiring route was probably used on some cars. However I am also reasonably convinced that the over tool box route is also likely to have been used. There seems enough evidence to support this and it is the most tidy way of routing the wiring without crossing over other wires, pipes etc. But when did changes come about if infact that is what we have? The electrical system on the saloons and tourers went through several changes during the 65/Nippy production period so it stands to reason the wiring on our cars almost certainly also changed. 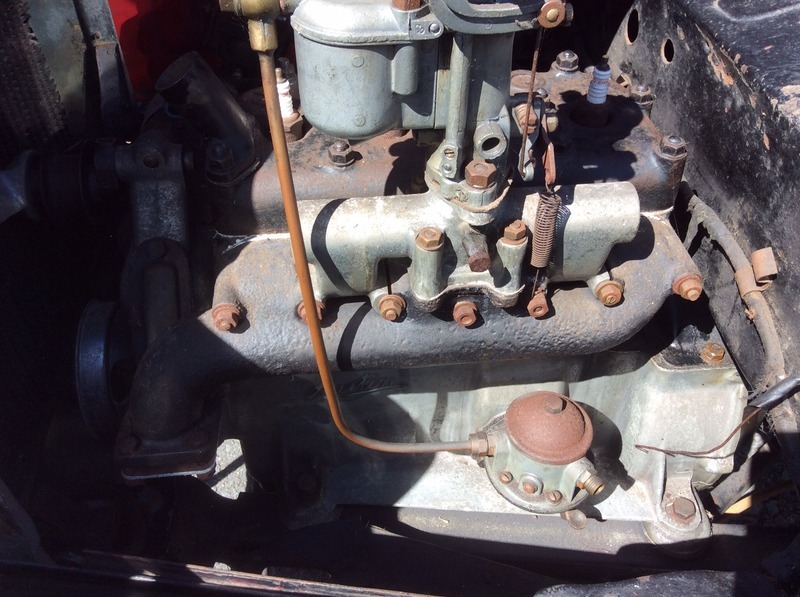 One of the things that has complicated the issue for the restorer is double dip headlights, having been originally wired single dip on the nearside only, and probably modified during the post war period. Comment 2: as this becomes clearer, we are still left with some cars like my early 1935 body and the similarly-aged one in the second photo down having NO extra holes across the top. (216-219000-ish chassis) That could mean that the green car above had the holes made by the owner when the loom position was required. But we don’t know where that car is to assess whether they are “factory holes”, or not! Perhaps the green car IS later than 219,000 but before the formal changeover to the later CFR2 unit – and the factory holes were added to allow people to retro fit wiring upgrades? The very late car it seems DOES likely have an original loom so it seems clear that those holes were never used. Conversely Gould’s car in the early 250,000s HAS evidence of a (presumed-original) loom being in that position in the 1960s. Q: Why practically would one put the junction box for the steering cable right up next to the control box and not down on the lower bulkhead? It is a fairly logical place for it as the trafficators pick up a supply from the nearby fuse and the wiring then goes through the top of the bulkhead on its route to the trafficators. If anyone has further thoughts or evidence, please make contact. Particularly if you can assess whether you have firewall holes that are in the same positions as those in the first picture of this post, be they being used for wiring or not! A further post will attempt to list the phases of the wiring evolution to the best of our current knowledge – this is only intended as a discussion document for you to feed back from.